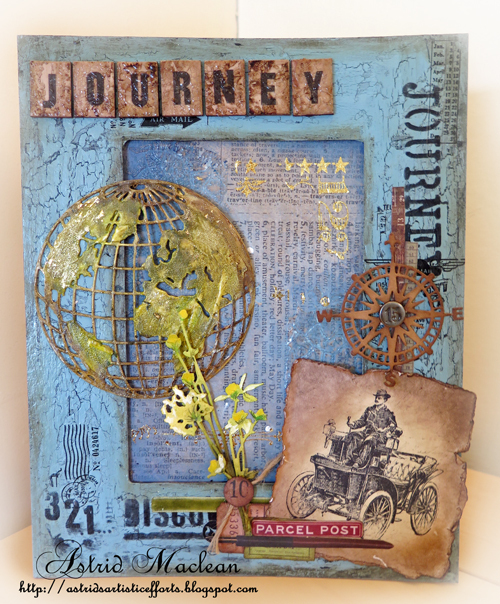 Hi everyone, Nikki here today with our final stop for this month's Destination Inspiration posts. As has become our custom let's have a quick review of what our travel bag includes this month and how the other Creative Guides have used the contents. 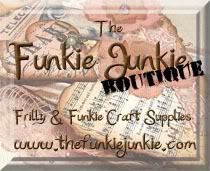 I love seeing them all together as it shows that the same products can be used to create quite different results! So onto my creation - I decided on a reverse canvas. I began by preparing my canvas. As I am using the reverse (to create a shadow box effect) I need to have something to hang it with - so I add a couple of drawing pins into the back. I then coated with gesso. When dry I took some texture paste and filled the gaps inside, covered the staples and generally covered the borders. Again when dry I mixed some burnt umber with gesso to paint it brown. 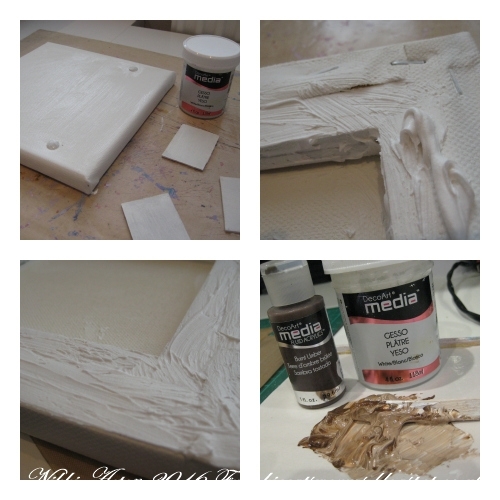 Gesso again and this time dry brushing over the brown, picking up the texture and creating some contrast. 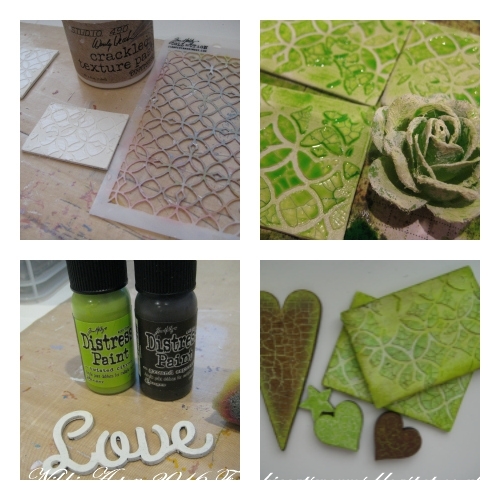 When dry I added a slightly watered down layer of twisted citron distress paint. 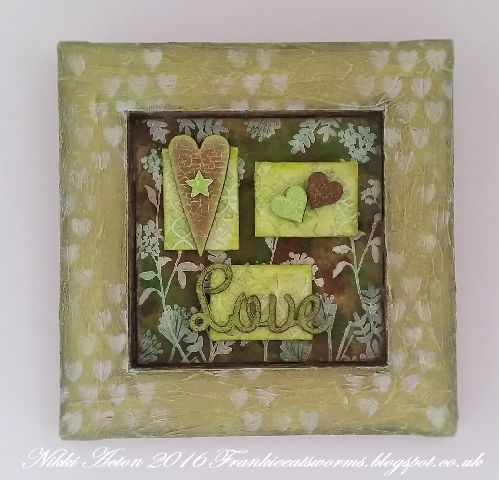 At the end I decided to add some stencilled hearts to the frame, so I dry brushed gesso through a hearts stencil. 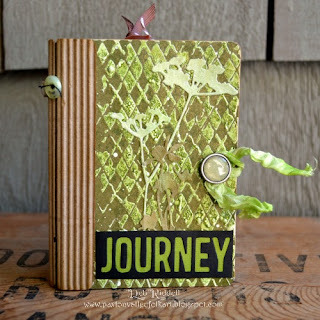 I cut some kraft card to fit the inside and stamped with gesso to create a resist for the inks that followed. I used a mixture of stains and sprays over the card. The embellishments inside were all crackled in different ways. 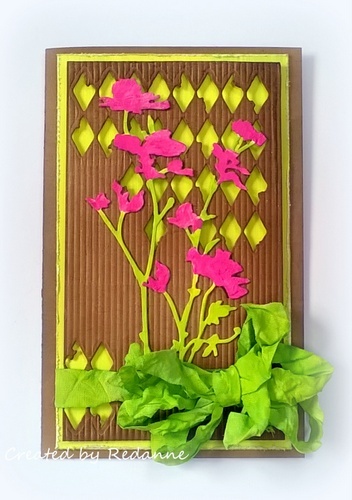 * The panels were cut from grey board, painted with gesso and Wendy Vecchi crackle paste added through the latticework stencil. Once dry I added twisted citron distress spray. 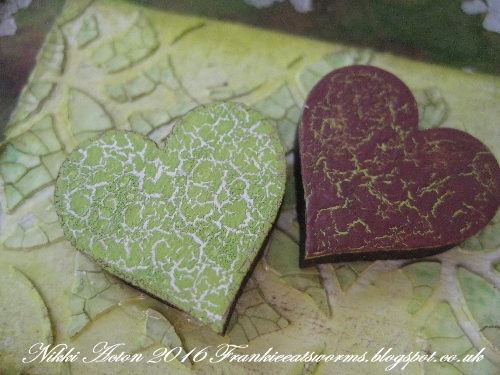 * The smaller hearts used Deco Art weathered wood crackle glaze. 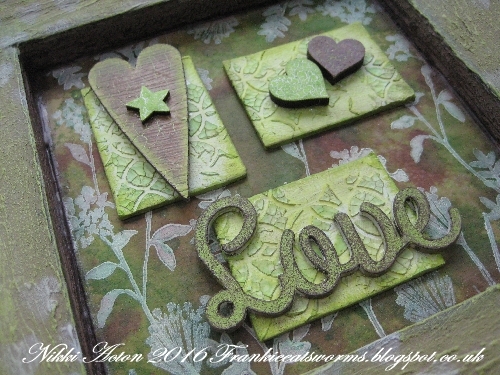 * The chipboard love was just painted and the flower - I didn't use in the end! 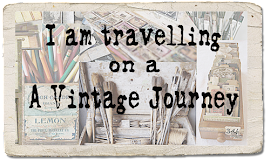 I hope you have enjoyed this month's Destination Inspiration series - a new one, with a new travel bag starts next Monday, but before then do pop back on Friday for the start of a new challenge! Fantastic final DI project Nikki!! 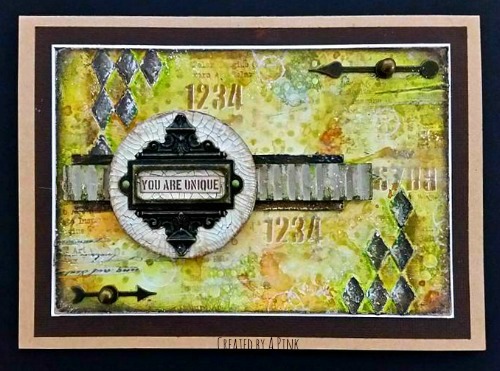 Fabulous background and amazing crackle effects! What a way to finish this months DI , Nikki with this fabulous reversed canvas. Love how you've used the gesso, the various crackles are fantastic, the colours are just perfect and wonderful composition . 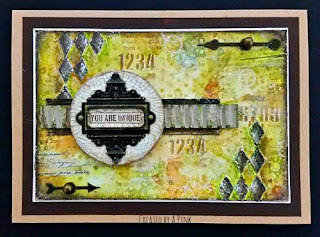 Stunning project Nikki with wonderful crackles and layers. 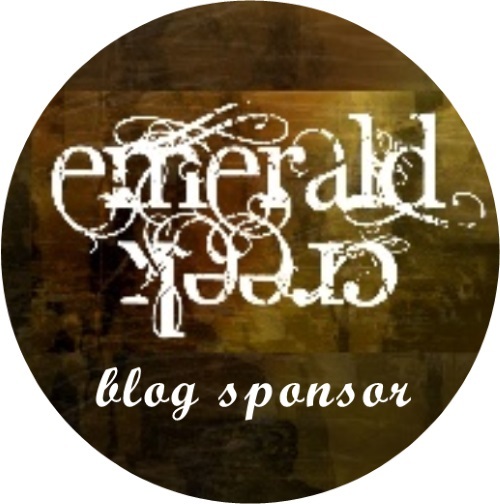 A wonderful month with fabulous projects and inspiration from my Teamies. Nikki, you have used the contents of your travel bag with utmost creativity! I love the different crackled elements--and so many ways to get there! The frame alone is just stunning with those colors! As always, I learn so much from your techniques. Great tutorial! Hugs! 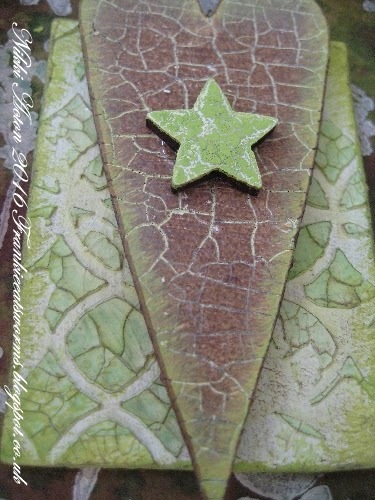 Gorgeous gesso resist and stunning crackle variations - this is a fantastic finale to another brilliantly creative month.